Video by BRLM Photographer Paul Purpura: Shot Saturday – July 25, 2015 at at the Rodes Farm Barn when local musicians joined students of the Wintergreen Summer Music Academy for a morning of string orchestra repertoire. The Wintergreen Perform Arts Summer Music Festival continues for the next few days. 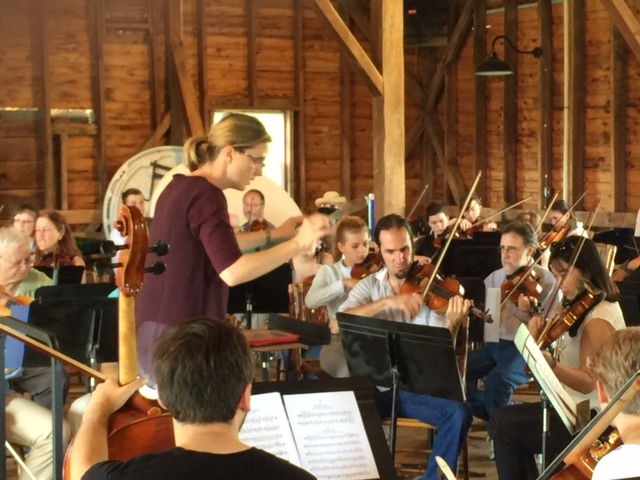 On Saturday a different twist as locals joined students of the Wintergreen Summer Music Academy for a morning of string orchestra repertoire in the Rodes Farm Barn. Photo by BRLM Mountain Photographer Paul Purpura : Artistic director Erin Freeman conducts members of the Wintergreen Summer Music Academy and locals who joined in the music at the Rodes Farm Barn, Saturday – July 25, 2015. The Wintergreen Summer Music Festival continues until August 2, 2015. But even after that be sure to enjoy even more music as WPA hosts the annual Blue Ridge Mountain Music Fest on Saturday – August 15, 2015. Blue Ridge Life Magazine Publisher Tommy Stafford will be back again as the emcee of the event.